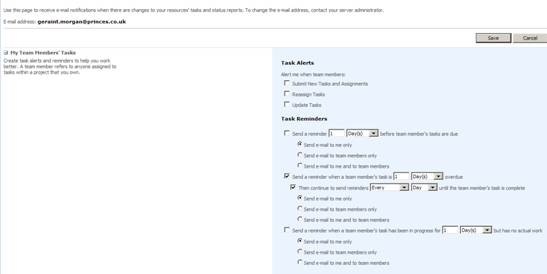 The following blog details the settings and email formats behind the task alerts and reminders page. I originally wrote this in word using lots of tables and it hasn’t transferred very well to the web, apologies for that! Each resource is able to configure the frequency of email alerts and reminders for upcoming and overdue tasks; additionally, Project Managers can also configure their resources’ email reminders. If a Project Manager configures email alerts and reminders for their resources, the Project Manager’s settings override those set by the resource. To configure email alerts, click on Personal Settings | Manage My Alerts and Reminders. Note that this guide deals with Task alerts and Reminders only and not Status Reports. The options on the screen are split into two sections, Task Alerts and Task Reminders. The following table shows the email format for each option. Below are the latest schedule changes. Contact your project manager if there are any problems with the changes. You have been assigned to the following assignments. Your work assignments below have changed. The following tasks are scheduled to start soon. The following tasks are scheduled to finish soon. The following tasks are incomplete. The following tasks are currently overdue. The following tasks could be overdue and incomplete. It is possible for a Project Manager to configure email reminders for their Team Members. These settings override any Task Alert settings that a resource makes. Note that for task alerts, the Team Member refers to anyone assigned to tasks within a project that you own. <Resource Name> has submitted the following tasks. <Resource Name> has reassigned the following task. The task has been reassigned to the following resources. The following assignments have been updated by resources. Note. Managers can set up Task Reminders for resources that can be sent to either the manager, resource or both. These are set up by checking the relevant radio button (Send e-mail to me only, send e-mail to team members only, or send e-mail to me and to team members). Reminders sent to the Project Manager are known as Manager Subscribed Reminders, and those sent to the resource are known as Manager Derived Subscribed Reminders. Each type of reminder contains the same specific task information, but has a slightly different header. The Manager Subscribed Reminders (those sent to the Project Manager) have the words Assigned to: associated with each task, and the Manager Derived Subscribed Reminders have the words Manager Name: associated with each task. Subject: Task reminders – Microsoft Office Project Server 2007 notification service. Manager reminder: The following tasks are scheduled to finish soon. Manager reminder: The following tasks are currently overdue. Manager reminder: The following tasks could be overdue and incomplete. Manager reminder: The following tasks require updates. The following tasks for your resources are scheduled to finish soon. The following tasks for your resources are currently overdue. Subject: Task reminders – Microsoft Office Project Server 2007 notification service.Task reminders – Microsoft Office Project Server 2007 notification service. The following tasks for your resources could be overdue and incomplete. The following tasks for your resources require updates.